Pool, Spa, and Hearth retailers are no exception. Although their products might not be thought of as “traditional” Christmas gifts the same way toys, candy, and Red Ryder Carbine-Action Two-Hundred-Shot Range Model Air Rifles are, there’s still something for everyone. Consider the numerous accessories swim enthusiasts, hot tub conniosseurs or couples looking to improve their home with a beautiful new fireplace can enjoy. Did you know most people prefer to receive gift cards and that 81% of gift-givers will be purchasing gift cards? There are countless ways to market your products as Christmas gifts to consumers and we’re here to help you out. Black Friday is not completely dissimilar to the Hunger Games and other kill-or-be-killed games of survival. Retail stores are packed with stressed, goal-oriented consumers and workers are stretched thin between seeing the needs of every customer that walks through the door. Checkout lines are long and patience is low. Time and efficiency are key, and for that, you need to utilize line busting. What is line busting? Line busting is the practice of using wireless mobile technology to check out customers from anywhere in the store. Thanks to EMV chip technology and portable terminals, retail employees can now complete transactions from wherever customers are standing. This saves time, reduces stress and impatience, and allows for more consumer spending. Our newest product, Evosus Pro, is perfect for line busting. Fully integrated with QuickBooks Online, Evosus Pro is a Cloud-based point of sale solution that allows retailers to complete transactions quickly from any device with an Internet connection. For more information about Evosus Pro, follow this link! Holiday shopping can be stressful and overwhelming. One way to reduce customer stress and improve brand image is to create a positive in-store experience. This can be accomplished through seamless transactions, carefully organized inventory, and holiday-themed decorating. After all, there’s a reason why travel websites will advertise holiday window walking tours – people love seeing holiday decorations. Attract customers and differentiate yourself by creating a holiday theme for your marketing campaign, decorating your store, or even just playing a Pandora playlist over the loudspeaker. For important sale days, such as Black Friday, consider contracting “hired guns” for the event. These people have one goal in mind: sell as much as possible. And they’re very good at it. Do you sell swim spas? Hire live swimmers. Do you sell fireplaces or other home furnishings? Hire floor models. This type of marketing is called sensory marketing because it uses visual, auditory, or olfactory elements to communicate an idea or message without directly stating what the message is. Videos are an effective way to increase engagement. Not only are they trendy but they are straightforward and attention-grabbing – people can’t resist clicking on videos and once they do, they’ll be focused on whatever the video contains. Best part? The video doesn’t have to be spendy. Not only is there plenty of affordable video making software available, such as Animoto or Boomerang, but even a low-budget video can go viral if it’s creative enough. Need an example of a low-budget, amusing, and effective video? Here’s one for Hearth retailers – all it shows are close-ups of fireplaces and customer reviews. And it has nearly 400,000 views. How your video should look and where you should upload it depends on what you’re trying to achieve. Whether you upload a short, quirky video to Instagram or a long, informational video to YouTube, your video should focus on the needs of your target audience (holiday deals), the products or deals you’re offering, and what makes your holiday sales promotions unique. These days, people are bargain-crazy – especially during the holiday season. 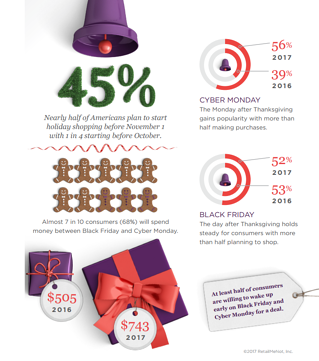 According to RetailMeNot, 52 percent of customers plan to use a deal or offer when shopping for someone else and 48 percent of consumers will shop in a store based on the deals they find. Offering a gift certificate, coupon code, or dollar-off amount not only attracts shoppers to your store and helps move product but incentivizes shoppers to return. You can email your customers printable coupons or offer gift cards in-store. Remember: 81% of gift-givers will be purchasing gift cards. Email marketing is a powerful tool. Not only does it yield a massive return on investment (for every $1 you spend you can expect a return of $38) but it leads in customer acquisition and retention. For a Black Friday or Cyber Monday email marketing campaign, you can start by promoting your upcoming sale event the week before. Try segmenting your target audience by their shopping patterns or interests and include relevant promotions based on that information. For your most loyal customers, you can even include special deals and coupons. If you’re an Evosus Enterprise client, you can easily generate lists for leads and customers and launch automated email campaigns. For small businesses, having a strong online presence is vital. Use your social media accounts to promote your upcoming sale event and invite people to spread the word through sharing or retweeting your ads. Get creative and personal – center your posts on a holiday theme or upload pictures of employees or customers having fun. You can even place ads on Facebook and Google that will directly target your audience based on their shopping patterns and location. The holidays are an incredibly wonderful time of year. With a little creativity and ingenuity, you could be raking in customers by the dozens. Don’t let the festivities – or opportunities – pass you by – use these marketing tactics to get the most out of your Black Friday.